Our Lipo Safe Pockets were designed to be the perfect size and shape to fit a single Lipo battery and help minimize clutter in your work area. This model (5" x 2.5" x 2") was made to accommodate standard 3S Lipos (hence the 3 in the product name) up to about 2200mAh. They also work great for multiple smaller lipos. All of our Lipo Safe bags are made from durable fire-resistant materials to help protect you and your belongings in the event of a Lipo battery fire. With a secure heavy-duty velcro closure and vents to reduce pressure, Lipo Safe bags are designed to help contain the heat and flames that can result when a Lipo combusts during charging or while in storage. While Lipo Safe bags can help provide some much-needed protection, it is still crucial to follow the proper precautions for Lipo battery charging at all times. Ensure that charger rate is properly set and polarity is correct. Attach charging leads to battery. Place battery in Lipo Safe towards the bottom. Place Lipo Safe on non-flammable surface. Route charge leads through vent at the top seam of the Lipo Safe. Close and secure the velcro on the Lipo Safe top flap. Charge battery using proper charging practices. Avoid damage to the Lipo Safe. Replace if it becomes ripped, worn or is involved in a battery failure. If your Lipo Safe is involved in a failure resulting in a venting of the battery and fire return it to CommonSenseRC.com with a statement of the circumstances and receive a replacement Lipo Safe free of charge. "You're a life-saver. Saved me a lot of $$$, too! I'm returning a burned battery charging bag ASAP for exchange. It may have saved my house! 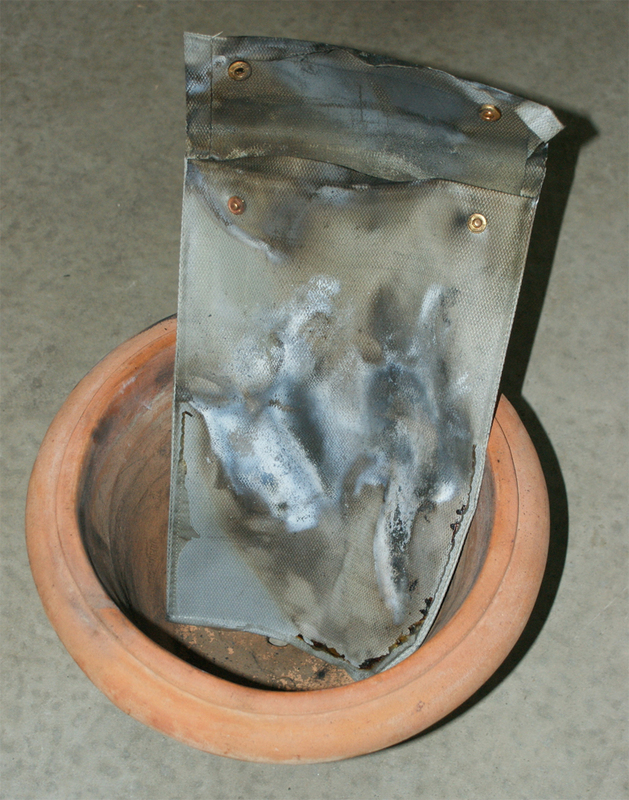 I was charging a 4350 mah battery in it in a clay pot in the garage, and it cooked off. I don't know why. The battery must have experienced damage somehow. It filled the garage with dense smoke, but there was no damage to the house or contents! I've ordered another from you as a backup. Wonderful invention!!!!" Check out this video of the Lipo Safe in action!